Not the weather, which is glorious but totally unexpected given Michelle and I were snowed on just over a week ago, but planting out. There are many oh-so-casual strolls being taken around the site, me included, with not very surreptitious glances at plots to see if anyone has taken the leap yet, and if so with what…My neighbour’s put his tomatoes in already – he did it last year too and was picking ripe tomatoes in June. Much to everyone else’s envy. 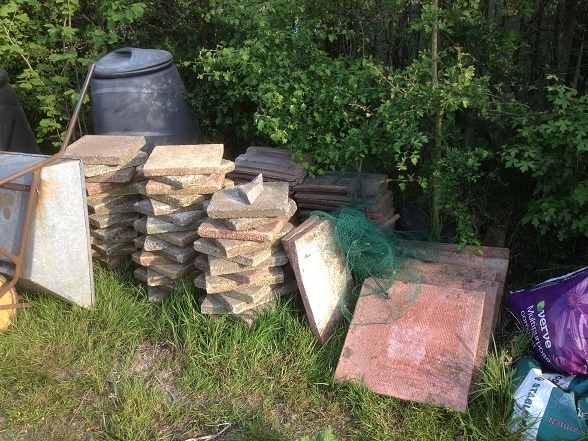 Thanks to freecycle I have what looks like enough paving slabs for a second shed base (it will need raising) but I am beginning to feel a familiar panic. After the shoddy April I have very little ground ready and if I do move the shed my planting plan is likely to need a severe cull. There’s no hiding the fact that I am 2 prepped beds short and I have a small mountain of plants needing, at the very least, a good potting-on. 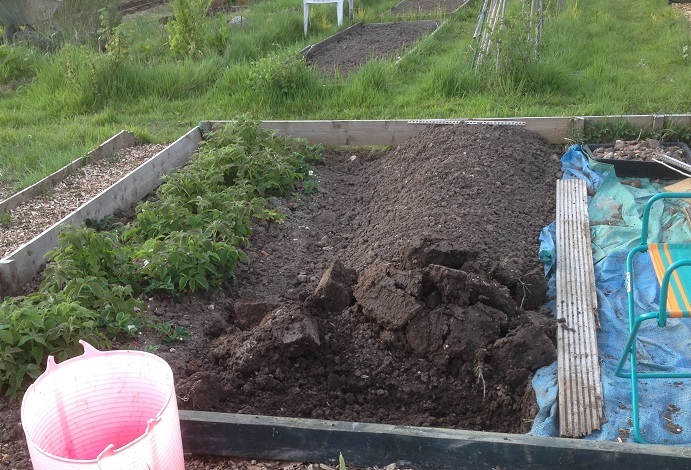 Plus the bleedin’ strawberries need yet another intensive sort out (weeding, thinning and mulching) and that bed’s completely set into concrete. I can’t get a handfork or trowel in so the big guns are going to have to come out. I know with my lack of hand/eye co-ordination this will mean casualties. I now have a fresh supply of dahlia stakes (bye-bye any thoughts of a huge harvest profit this year!!) so at least my bean frames can be built, but every squash seedling that pops its head up sends me into another small spin of joy & worry. I have been busy on #92, though those exploratory strolls and time set aside for sitting and staring don’t make me hugely productive. I’ve dug (and sifted out all bindweed, couch and buttercup taproots) a raspberry extension for an additional 6 Joan J runners, which will be underplanted with strawberries. I’m hoping the raspberry foliage will camouflage the berries and fool the birds, since I can’t net the area this year. The soil looks impressively fluffy, and, till it’s planted up, a bit like a giant’s grave. All the berries are looking impressive this year. One of Mum’s old redcurrant bushes is a bit lacking in leaves, but is absolutely covered in strings of future berries. I am going to have to figure out a group netting of pots. 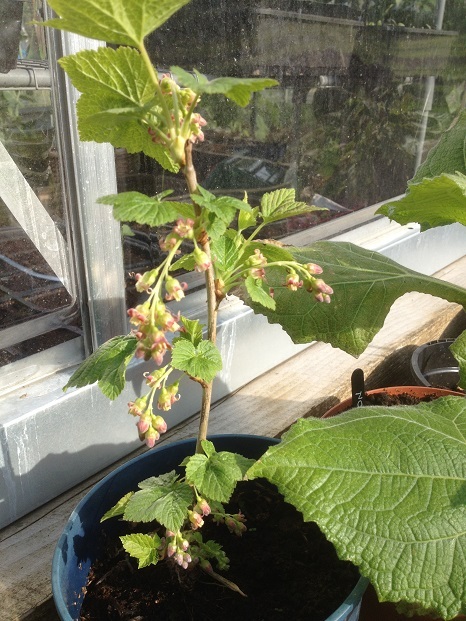 Even the blackcurrant cuttings I rooted last July (blackcurrant insurance) have flowered and have a small crop of berries on. 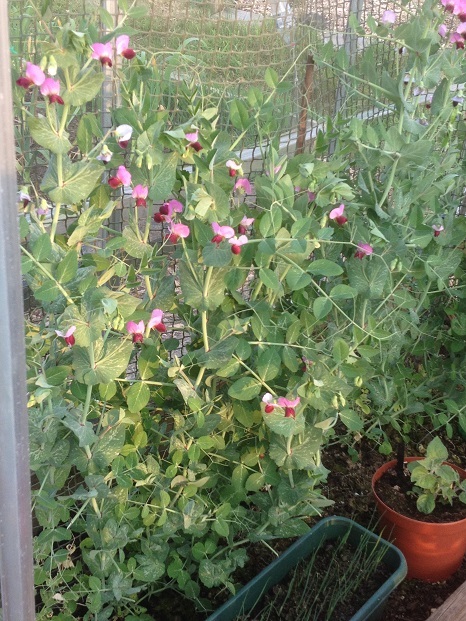 Kent Blue peas are in full flower in the greenhouse, with many a mini-mangetout showing. With the warmth in there the flowers are changing from red to blue very quickly – outside they are navy for a little longer. The first crop should be ready by the end of this week. I might have sown and planted these a little late this year. It works though – really early mangetout and it’s lovely to have something growing and harvestable so early in the season. Definitely one to repeat, and there is the added bonus of being able to snack on the shoots while pottering around in the greenhouse. 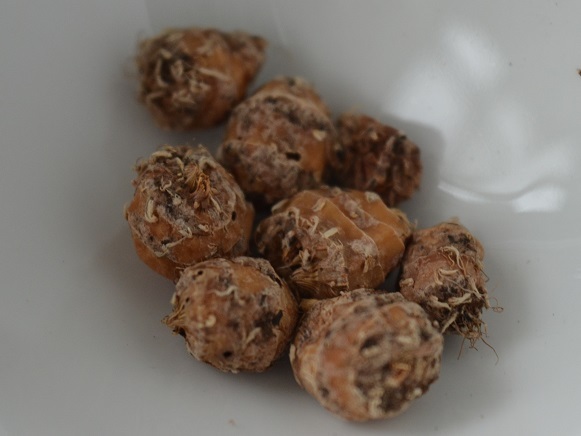 Sowed: kiwano, stevia, chufa (since monkey nuts totally failed, pic below), Sugar Lord peas, achocha (giant – which look very different to the standard achocha, pic below), electric daisies, cerinthe (for Mum) and some of the dwarf French beans – Nun’s Belly Button, Black Coco, Purple Teepee, Montcalm Red Kidney. Need to find the other packets of Sucrette and Trial A squash too – they are somewhere in the chaos of seed packets. 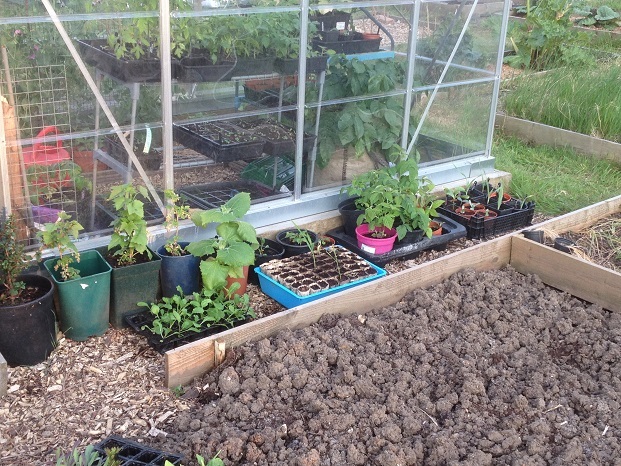 Next up on the to-do list: planting out 2 fruit trees, planting one g/h border with tomatoes and chillies, planting out seedlings from the outdoor nursery, sorting out the strawberry bed and attacking the digging on #100. I underplant with strawberries a lot and I find the opposite personally. When fruiting they tend to be target #1, and distract the birds for a while from anything else growing nearby. Ah well, at least there’s an upside…I have another 2 (netted) beds. This is the brilliant antithesis of those neglected/underused plots and it’s great to see how much you’re cramming in. Do you wish you had a third one? Thank you, that’s lovely to hear. In theory I’d love a third, but in practice I think it would break me! I do a version of double digging initially and I’m not quick at it. Banned/Left you need to tell me more,mind you it has gone downhill ,I might just do that and have a look at the GYO forum. For me, chillies, squashes beans and the melons etc, not to much this year due to family problems. Sorry to hear you’ve got challenges but at least you’ve picked all the best foods to grow – tomatoes notwithstanding! Hope family life gets smoother. Will definitely let you know how the kajaris do – am hoping to save seed from them too. If only I were! Am realising that I have been very optimistic with my planting plan!